My studio is above the county historical museum, and some of their holdings are still stored in cupboards up here. There are several shelves of old shoes from all eras, including these wonderful little child's leather boots. I'm guessing these are probably late 19th/early 20th century. 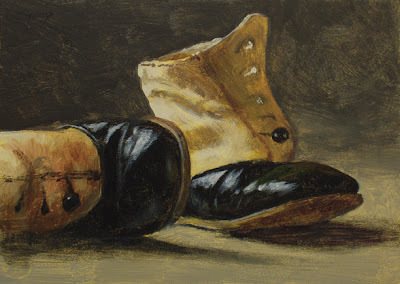 I'd like to do a whole series of shoe paintings--we'll see if it materializes. This painting and Saturday's post were done with Golden Open acrylics. I bought a sample set and am experimenting with it. The paint stays wet much longer on the palette and canvas than conventional acrylic. It takes some getting used to--I'm just learning how to handle it. The paint has a much more resinous, gooey feel, almost like honey. Still, I'm thinking I could learn to like it...time will tell. I would love to hear reactions/tips from any of you artists out there who are using it. Very neat painting. I want those shoes. I love the baby boots Don and I think a series would be very exciting and different. As to the Golden Open acrylics however, I bought some and hated them. Someone else said it felt like painting with bubble gum! You have achieved wonders with them I must say in this painting and I wouldn't know you were using anything different (which is what you want I suppose). If you continue to like them I might as well post these off to you because I shall not use them I know. Hoping to find out what kind of acrylics you usually use? I've tried a variety and prefer M. Graham or Winsor Newton. I like to try different kinds. Nice one, Don! I've been thinking about trying the Golden Opens, but haven't pulled the trigger yet. I may just order the primaries and play around with them. Sheila's description doesn't sound too terribly appealing, though! Hi Bill--thanks a lot. I don't think they'd fit you. Hi Sheila--thanks. I need to get some of the Open mediums to see how that modifies the paint. Regular acrylic medium just makes it behave more like regular acrylic. I want to give the stuff a fair trial before I yea or nay it. It DOES seem a bit like painting with bubble gum. :>} Certainly requires a different approach. I do like experimenting with it, though, and there's a certain richness of color that I like. Martha, I do murals and so have a large stock of an acrylic paint called Novacolor, made by Artex Mfg. It's a pourable and durable paint made with muralists in mind, sold in sizes from pints to 5-gallon buckets. I also have some regular Golden acrylic, which is great paint. I've not tried M. Graham acrylics, though I really like their oils and watercolors. Hi Zack--thanks. I bought a couple of sample sets--think it was from Jerry's Artarama. Some of the colors in the set are a bit funky, but it's enough to get a feel for it. I think if one expects it to be similar to regular acrylic or like oil, they'll be disappointed. I'm trying to think of it as its own medium with its own properties. Nice paintings, Don. I've been using the Golden Opens for about three weeks now and love them. Yes, they tend to feel sticky, but that is easily controlled with the mediums. Try the mediums. Another thing I've noticed is that they don't have the pigment load and covering power of the regular Golden acrylics. But I can live with those things - easy trade offs for the extended open time. Thanks, John. Yes, I need to order some of the Open mediums. I have noticed the lower pigment load. The positive trade-off of that is a certain color vibrance with the ground coming through, similar to watercolor. I would think it should be good for glazing, especially with the mediums. Yes, the open acrylics are great glazers with the mediums. If I were you, I would buy all three as long as you're ordering some. They're inexpensive and make all the difference. Thanks, anonymous. I just ordered some more colors and all three mediums...so we'll see!